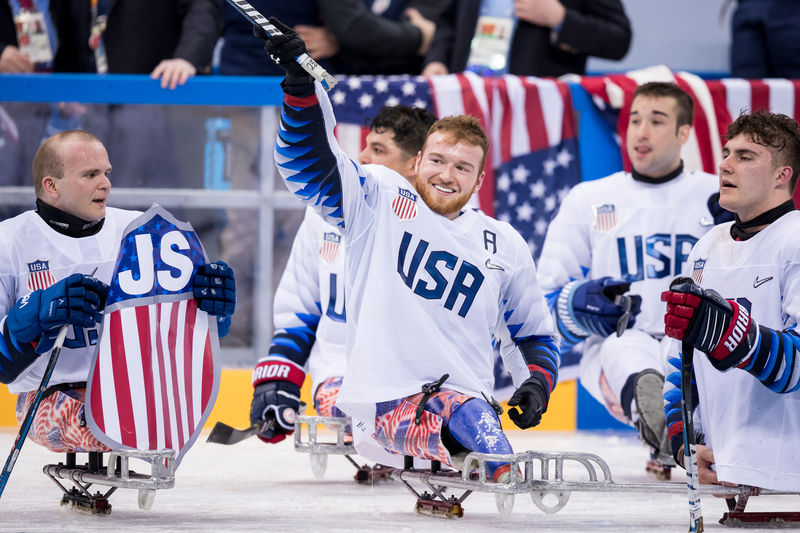 Smiles and tears were only part of the celebration and ceremony after the U.S. Paralympic Sled Hockey Team won its unprecedented third straight gold medal at the Paralympic Winter Games. While gold-medal game hero Declan Farmer, Tournament MVP Brody Roybal and all-world goalie Steve Cash sang their hearts out to “The Star-Spangled Banner” during the medals ceremony, they sang loud enough with the prayer that someone not there would hear them. Former head coach Jeff Sauer, who passed away in February of 2017, led the United States to Paralympic gold in 2014, and while he wasn’t there in body, he was certainly with them in spirit at the Gangneung Hockey Center. “A lot was said about Coach Sauer during the tournament,” said head coach Guy Gosselin, a two-time Olympian who served as assistant coach under Sauer for the 2014 Paralympic gold medal. “The guys had something to play for there. Our locker room was very motivated, and Coach Sauer was a big part of that inspiration. When he got involved, he really provided the team with structure and the importance of being a tight-knit group of guys working for one goal together, and everyone had a role to play." USA Hockey sled team general manager Dan Brennan said the presence of Sauer went beyond just memories. Farmer, who scored both goals in the 2-1 overtime victory over Canada for the gold medal, also agreed. Farmer scored the game-tying goal with 37.8 seconds left in regulation, and the game-winner 3:30 into overtime. The game-tying goal came on a rush following a Canada shot that rang the post of an empty net after Gosselin pulled Cash late for an extra attacker. Farmer led the tournament in scoring with 11 goals and 17 points while Roybal earned Best Forward and MVP of the tournament after equaling Farmer’s point total with 10 goals and seven assists. Meanwhile, Cash became the only goalie to go 3-0 in Paralympic gold medal games. While the victory paid homage to Sauer, Brennan made no bones about who really deserved credit for guiding Team USA to the Paralympic three-peat. “Make no mistake, this was Guy Gosselin’s team,” Brennan said. “He did a heck of a job, oftentimes through unfortunate circumstances. 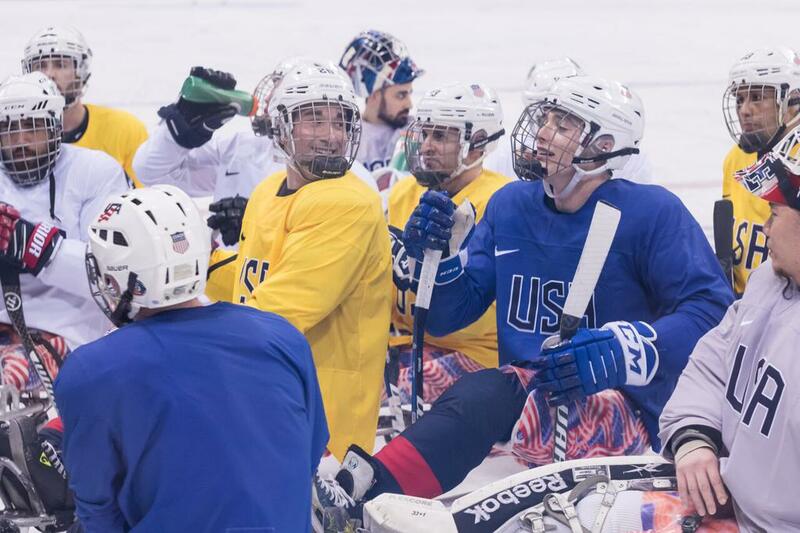 Gosselin’s Team USA dominated in the tournament, rolling over every opponent in the preliminary round behind the stellar netminding of Cash, considered one of the greatest sled hockey goalies in history, and his goaltending partner Jen Lee. Cash had four wins, two shutouts and a 0.29 goals-against average while Lee registered a shutout win in the tournament-opening game. Team USA defeated its first two opponents, Japan and Czech Republic, by matching 10-0 scores before shutting out host Korea, 8-0, to win its preliminary round group. In the semifinal, the U.S. bested Italy, 10-1, to stage the gritty come-from-behind 2-1 overtime win over rival Canada for the gold medal. 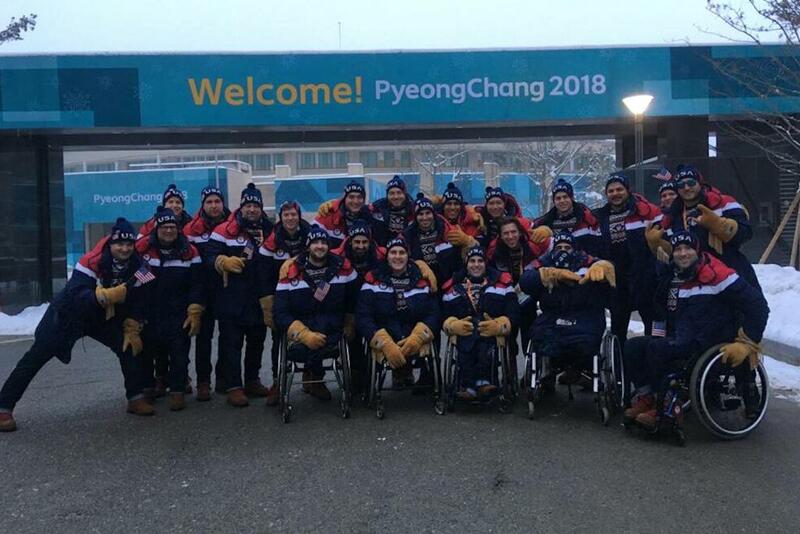 “It was an absolute honor to coach this team and help them finish the mission Coach Sauer started, and that was to ultimately win this Paralympic gold medal,” Gosselin said.